It is said that a picture is worth a thousand words but being a text man, I am not so sure: for description read Wordsworth or Dickens; for photography, try Adams. I have described some of these roads before but never really get it right; and now I have photographed them as ridden, but still feel that the very essence is missing. If you want a job done properly, do it yourself: if you want to know what it is really like, come and ride these roads yourself. I lost my cameras about a year ago and the replacement "point and squirt" was not up to the job at all. I finally got round to buying a reasonable digital camera and then after a week or so, lost it. Much to my delight, one of the technicians found it for me. I had left it in a lab after teaching Unix on our Silicon Graphics machines. I could have sworn that I carried it out. Obviously not a reliable witness, M'Lud." 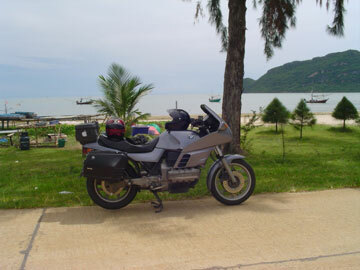 So with the bike back on the road, I took a couple of exploratory trips, then last weekend put the houseboy on the pillion as I had promised him a day at the sea-side. We went first down to a national park in Prachuab Kiri Khan province, but I did not feel like paying the high rates for foreigners for entry to the park (especially being a taxpayer here) just for lunch, so we took a side turning and found a nice little beach. I would have been happy to stay there all day (and all the rest of my days) but this was not what had been ordered. Back to Hua Hin but that was definitely not on; so I took to the hills. 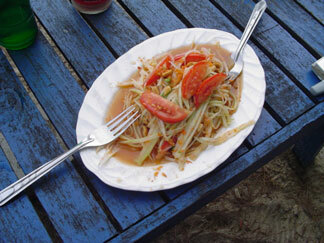 Finally, we arrived at a busy beach, just near Petchaburi and sat down looking at the sea and the sea monsters, and eating food like fresh grilled squid, crab, fish and the Tai spicy salad, known here as "Som Tam" which I am rather fond of. A dash back to Bangkok and we were home in time for tea. When asked if he wanted to ride again, the response was "I'll let you know." This morning (Sunday 28 Sep 2003), I was all ready by 0715 and the response from other potential passengers was little more than a grunt, so I was off alone. There was a bit of cloud cover but as it had been raining for the last 5 days, this was a massive improvement and, as I am in the middle of exam marking, I needed the exercise. 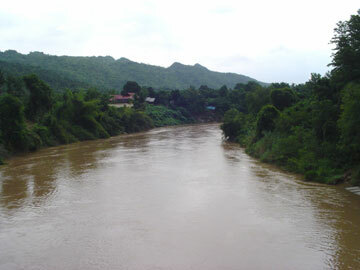 First stop was the Jet fuel stop and then full throttle (so to speak) for Kanchanaburi where I arrived just after 0800. I headed for a bridge known to locals only but found that it had gone. There was construction the last few times I was here, but now we had a two-lane bridge instead of the single-lane (with passing points) of before. I never crossed this bridge without some show of politeness from locals -- no pushing and insisting on being first which would be the mark of a Bangkok driver. With room at the side, I stopped the K and unzipped the camera. 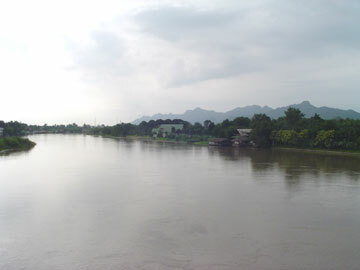 A shot towards Bangkok; and I crossed the road to take another, back towards the famous railway bridge. 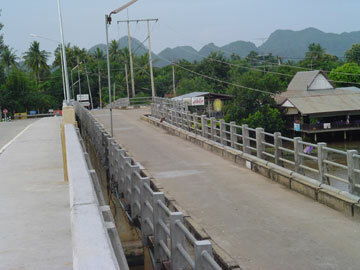 That was when I spotted the old bridge -- lower and to one side, it was not visible when driving over. 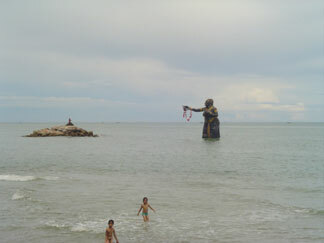 Although it is still there, it is almost inaccessible and probably destined for demolition. As I was getting my helmet back on, a low-loader trundled over. At the end, the driver reversed and was about to head back over the bridge, but waited for me to make the right turn. I waved: there was something about that bridge. What was an empty road has now had one or two small (but unobtrusive) resorts built, and some rather nice private houses. The rest is still agricultural -- cassava (I think) and maize. At the end, I rejoined one of the roads that follows the railway line and headed out into the country. 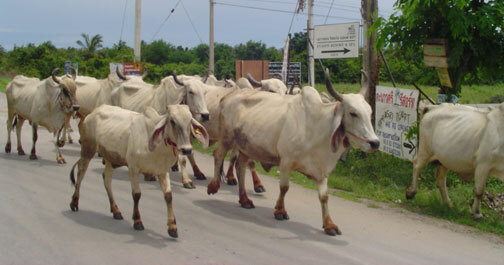 Speed was reduced several times by herds of cows -- Sunday must be cow-moving day -- three on this road alone. And when I joined another road, there were several herds -- well-behaved animals that are both timid and politely inquisitive. Something to be noted for one of those "what if" situations. A "What if" occurs at any time, and it is worth repeating this as a mantra when riding. It was taught to me on my police driving courses, although the best example was given to me by a long time crew-mate. Colin had an instructor whose name was Sergeant Peck -- with the nickname, Greg, of course. Greg was always telling Colin to grade his approach to blind bends, for "What if." It rankled Colin so much that when Greg was giving one of the demo drives, through te countryside east of London, south of Cambridge, at a higher rate than Colin would have dared, Colin said, "What if?" 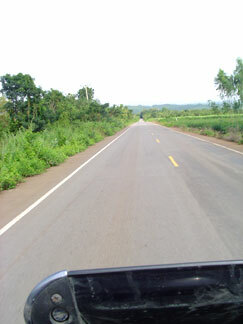 As if by arrangement, while at high speed, Greg rounded the bend to find the road full of tractor. He applied the brakes and stopped with no drama. he turned to Colin, smiled and said, "That's what if. . . ." A lesson was learned and never forgotten. I say this to myself sometimes when riding. The road I was on follows the railway built by prisoners of war in WW2. While the engineers chose the best route -- I think it had been surveyed intiially by the British Army in the 1930s or before -- and some is flat. Some sections of the Death Railway cling to the sides of cliffs or cut through rock. Much goes through jungle. It is much tamed these days, of course, but some indications exist of what the builders suffered. War cemetaries in the area are testament to the number who did not survive and it is heart-rending looking at the ages of those who died. Up at Hell-Fire Pass there is now a museum. Just after Prasat Muang Singh, there is a newer road which I took this morning. It used to be a track and even the R80g/s felt uncomfortable down the rutted mud; but one day I came along here and it was all nice clean tarmac. This is where I started to practice with the camera. In correspondence with another BMW rider recently, I asked how he had held the camera when taking pictures. Although his camera was one of those lovely Canons and much smaller than my Sony, the ideas he gave, put it in my mind to experiment. I looped the camera cord round the carrying case (and the case round my neck), so that if I did drop it, or have to put it away quickly, it would not fall. The next thing was to take pictures with my left hand. Starting on a straight road, I managed to turn the camera on (this was a breakthrough as the button is tiny and I wear thick riding gloves) and initially took pictures with the camera held vertically (portrait rather than landscape). Although this works for some images, 100% in portrait mode would not be a good idea. Then it dawned on me that, instead of trying to take pictures with the camera in the ordinary way, it would be just as effective if I were to hold the camera upssde-down. The software would fix that, and the left thumb could press the button. That was a whole lot better and by the end of that stretch I had taken a few, including the monk pushing a wheelbarrow through the village. I stopped on a bridge that was built across the Kwae River about 6 years ago and took a few shots. 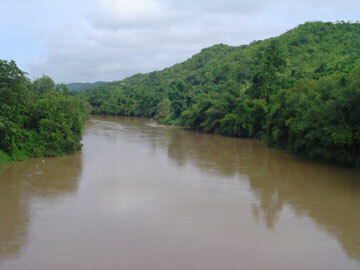 The water in this arm of the river is muddy with the heavy rains upstream close to the Burmese border. In both arms of the river the water is flowing fast this month. 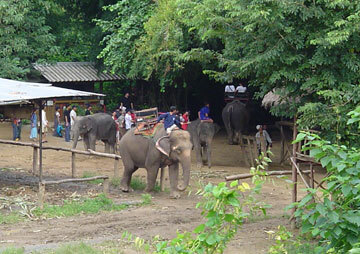 What would Thailand be without elephants, eh? 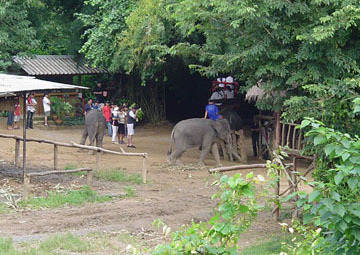 So I stopped off at the first of the elephant camps at Wang Pho (near the infamous railway viaduct). Business was booming by about 9am and the tourists were having lots of fun. I wonder what the elephants really think. At the end of this road, I have two choices: left for the normal road through the village and up the hill; or right, towards the viaduct, and then up the hill by a steeper climb. I usually take the latter as there is less traffic (not that there is much anyway round here), but that is me. I was tempted to stop for photographs on this hill, but without a sidestand and with the steepness, I cried off. 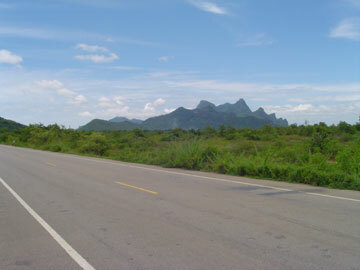 Eventually, this quieter climb rejoins the other road on its way back to the main Kanchanaburi - Burma road. On the way up, nowadays, there is a new warning sign: monkeys. 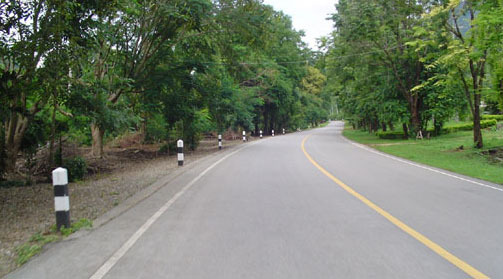 This road borders the new campus for my university (Mahidol University) and while the top end near the main raod was on fairly poor quality land that is being well-used, the bottom end was forest and there are now conflicts between the locals, the monkeys, the students and the developers. What was for years open for locals to pick what herbs they needed, is now restricted. And the university environmentalists are at odds with those in the university pushing for development. The monkeys have become more visible beside the road. Unlike the cows (above) they are neither polite nor timid: downright rude, and kleptomaniac. I did not stop but hit the highway and opened the taps before turning off and heading down one of my favourite roads: one that links this highway with the Sisawat road; another favourite.